From the Preface:The argument of this book ranges from highly theoretical speculations to highly topical problems of modern art and practical hints for the art teacher, and it is most unlikely that I can find a reader who will feel at home on every level of the argument. But fortunately this does not really matter. The principal ideas of the book can be understood even if the reader follows only one of the many lines of the discussion. The other aspects merely add stereoscopic depth to the argument, but not really new substance. May I, then, ask the reader not to be irritated by the obscurity of some of the material, to take out from the book what appeals to him and leave the rest unread? In a way this kind of reading needs what I will call a syncretistic approach. Children can listen breathlessly to a tale of which they understand only little. In the words of William James they take 'flying leaps' over long stretches that elude their understanding and fasten on the few points that appeal to them. They are still able to profit from this incomplete understanding. This ability of understanding- and it is an ability may be due to their syncretistic capacity to comprehend a total structure rather than analysing single elements. Child art too goes for the total structure without bothering about analytic details. I myself seem to have preserved some of this ability. This enables me to read technical books with some profit even if I am not conversant with some of the technical terms. A reader who cannot take 'flying leaps' over portions of technical information which he cannot understand will become of necessity a rather narrow specialist. It is an advantage therefore to retain some of the child's syncretistic ability, in order to escape excessive specialization. This book is certainly not for the man who can digest his information only within a well-defined range of technical terms. A publisher's reader once objected to my lack of focus. What he meant was that the argument had a tendency to jump from high psychological theory to highly practical recipes for art teaching and the like; scientific jargon mixed with mundane everyday language. This kind of treatment may well appear chaotic to an orderly mind. Yet I feel quite unrepentant. I realize that the apparently chaotic and scattered structure of my writing fits the subject matter of this book, which deals with the deceptive chaos in art's vast substructure. 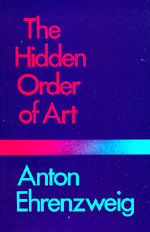 There is a 'hidden order' in this chaos which only a properly attuned reader or art lover can grasp. All artistic structure is essentially 'polyphonic'; it evolves not in a single line of thought, but in several superimposed strands at once. Hence creativity requires a diffuse, scattered kind of attention that contradicts our normal logical habits of thinking. Is it too high a claim to say that the polyphonic argument of my book must be read with this creative type of attention? I do not think that a reader who wants to proceed on a single track will understand the complexity of art and creativity in general anyway. So why bother about him? Even the most persuasive and logical argument cannot make up for his lack of sensitivity. On the other hand I have reason to hope that a reader who is attuned to the hidden substructure of art will find no difficulty in following the diffuse and scattered structure of my exposition. There is of course an intrinsic order in the progress of the book. Like most thinking on depth-psychology it proceeds from the conscious surface to the deeper levels of the unconscious. The first chapters deal with familiar technical and professional problems of the artist. Gradually aspects move into view that defy this kind of rational analysis. For instance the plastic effects of painting (pictorial space) which are familiar to every artist and art lover tum out to be determined by deeply unconscious perceptions. They ultimately evade all conscious control. In this way a profound conflict between conscious and unconscious (spontaneous) control comes forward. The conflict proves to be akin to the conflict of single-track thought and 'polyphonic' scattered attention which I have described. Conscious thought is sharply focused and highly differentiated in its elements; the deeper we penetrate into low-level imagery and phantasy the more the single track divides and branches into unlimited directions so that in the end its structure appears chaotic. The creative thinker is capabte of alternating between differentiated and undifferentiated modes of thinking, harnessing them together to give him service for solving very definite tasks. The uncreative psychotic succumbs to the tension between conscious (differentiated) and unconscious (undifferentiated) modes of mental functioning. As he cannot integrate their divergent functions, true chaos ensues. The unconscious functions overcome and fragment the conscious surface sensibilities and tear reason into shreds. Modern art displays this attack of unreason on reason quite openly. Yet owing to the powers of the creative mind real disaster is averted. Reason may seem to be cast aside for a moment. Modern art seems truly chaotic. But as time passes by the 'hidden order' in art's substructure (the work of unconscious form creation) rises to the surface. The modern artist may attack his own reason and single-track thought; but a new order is already in the making.